Every moment of life is precious. We never know what the next moment will bring, laughter or tears, joy or pain, but we have a choice of how to live life at this moment. The choice is empowered and guided by our heart, knowledge, awareness, and resources to name a few. As societies and professions grow, knowledge and resources expand and transform the possibilities. With the growth and awareness of rehabilitation medicine, people who suffer injury are given a hope not realized before. In January 2018, Move Together returned to Villa Nueva, Guatemala to treat, to teach, to learn, and to grow. 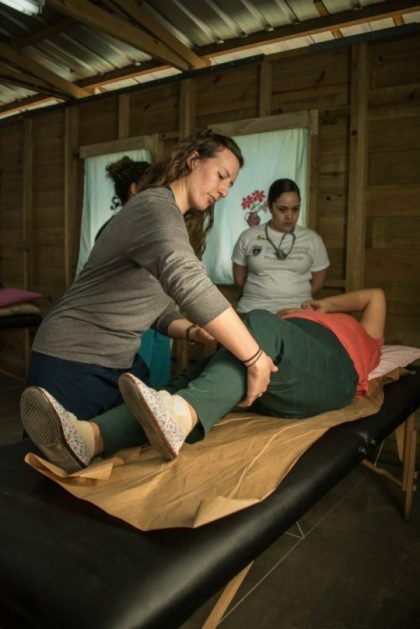 Physical therapy (PT) students and professionals from the U.S. and Guatemala joined together to learn and share techniques and ideas to maximize movement and people’s choices. During a home visit, Laura, a U.S.-based PT, met Maribel, a vibrant young 21-year old lady, whose life changed overnight. Maribel went into the hospital for shoulder pain and left paralyzed at the eleventh thoracic vertebra or T11 level of the spinal cord. This affects muscles and sensation from her waist down. The paralysis stemmed from an injection for the shoulder pain and the contraction of an infection that went into the spinal cord. The T11 spinal cord injury is traumatic but leaves open the possibility of independence with the right treatment and resources. Maribel had full use of her arms along with strong upper abdominal and back muscles. She also has some function in her legs thus the possibility to walk again with proper bracing, determination, and hard work., She and her mother were motivated and willing to do whatever was necessary to achieve the reality of independence and walking again. When Laura and Londy, a Guatemalan PT, arrived at the home, they were both encouraged and saddened. Encouragement came from the resourcefulness of the mother. 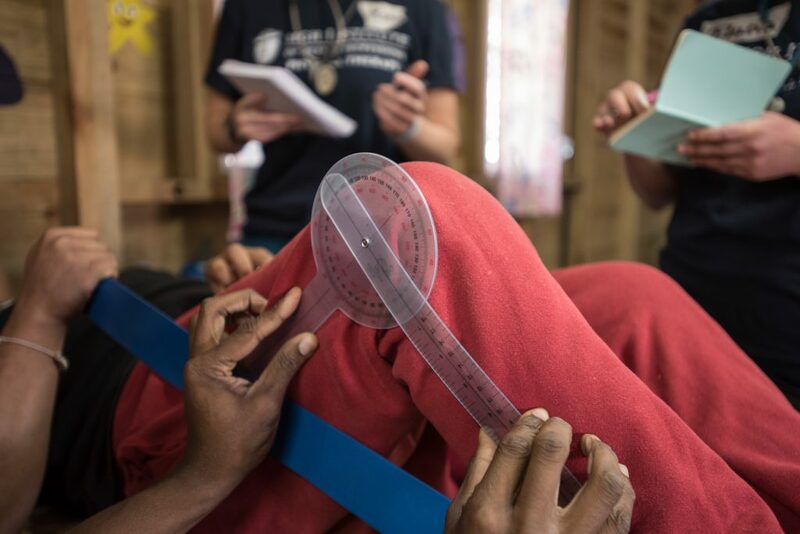 After visiting the Jairo Rodríguez Municipal Physiotherapy Clinic in Villa Nueva, the mother returned home, purchased 2 by 4’s, and reached out to a neighbor to build a standing frame similar to that used in the clinic. Maribel sought opportunities to engage and advance what was seen and learned in the clinic into the home, but her home presented limitations. Limitations because of lack of access to knowledge and awareness of other possibilities. Maribel had a wheelchair, but it did not aid her independence. 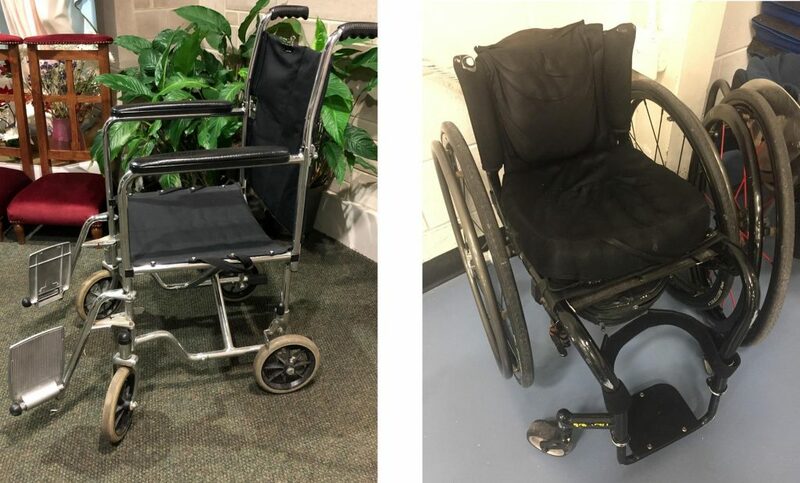 The large standard wheelchair made it difficult to get in-and-out and navigate around the house on her own. Laura and Londy shared with them a company that could assist in fitting Maribel in a more functional wheelchair and explained how a properly fitted wheelchair would increase her independence to transfer herself and move around the house and community on her own. Even without the improved wheelchair, she had possibilities before her. She could still learn and work on transferring herself independent of her mother. Laura and Londy, during the home visit, showed her transfer techniques providing a base knowledge, but Maribel gained a deeper sense of empowerment from learning from those who have also suffered similar spinal cord injuries. The personal testimony of someone who has suffered similarly provides a more meaningful sense of hope, accomplishment, and a can-do attitude. Since Maribel was young, energetic, and internet savvy, Laura shared with her YouTube University videos of individuals with paraplegia describing and showing proper transfer techniques. This new resource opened her world to more choices and an opportunity to embrace the moment today for change. In taking small steps today, she felt more confident and able to engage in society today as she works towards the ultimate goal of walking again. Laura shares, “Rehabilitation is not spontaneous. You need access to resources and people who can educate and share knowledge.” With increased access, people are empowered to go, take action, and transform life today and into the future. They become less dependent on others, especially PTs, as they now have the knowledge and resources to go and do on their own. And as we work with patients and communities, our goal is to empower lifestyle transformation and independence to maximize personal movement through bidirectional knowledge and resource transfer, thereby developing healthier communities around the corner and around the world.